In our last post we were lamenting the ill-health of our Numero Uno work ute Felicity (she was not living up to her lucky name last week) – but we are now happy to report that she is back on the road thanks to the great folks at Woodville Auto Wreckers (based at Gillman, actually, not Woodville)! While it’s never great to have a car break down, we are very lucky to have found such a great local auto shop who did their best to get us back on the road asap. So the lucky people of Adelaide can now see Felicity out and about ferrying our techs to fix roller shutters! This Christmas we will be working up until Saturday 24th December; we will be closed from 25th Dec to 1st January, and back to work from Monday 2nd January. 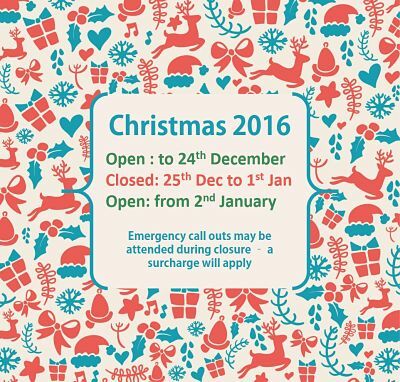 We may be able to assist with emergency call-outs over this time; if we are able to attend a holiday surcharge will apply. We do still have a couple of appointment slots available in the week before Christmas so if you do have a roller shutter that needs attention before Christmas please call us asap on 84473443 to secure a time.